The countdown has officially begun for the biggest event in the Muaythai calendar with the four competitors in this year’s Kings Cup Final now confirmed. After a change in format over the past three years, the four finalists of this year’s event were once again selected through a series of qualifying tournaments. Organized by Elite Boxing under the brand name of the EFN Champions League, the qualification series marks a return to the traditional method of selecting the finalists following the failure of various companies to stage a viable qualification series over the past three years. Held every year on December 5 in honor of H.M. The King of Thailand’s birthday, the King’s Cup is considered the most prestigious event in the Muaythai calendar. Sanctioned by the World Muaythai Council (WMC), the tournament is also widely recognized as the world cup final of Muaythai. While the date and venue of the final remains the same, this year marks a new era in the King’s Cup with the four finalists identified through a series of qualification tournaments organized by Elite Boxing under the title of the EFN Champions League. While EB has been involved in the King’s Cup for the past seven years in various roles supporting the tournament founders One Songchai, the Bangkok-based company has taken on the responsibility from this year of re-launching and rebranding the qualification series. Divided into four 4-man tournaments in the 70kg division, the 2015 EFN Champions League Series included two events in Bangkok and a double-header in Malaysia. The winner of each competition took home 150,000 baht in prize money and earned his place in the King’s Cup Final. Representing Thailand, Changpuek Muaythai Academy won the inaugural EFN Champions League tournament in Bangkok. Although another Thai fighter Chok Eminenair also won the second qualifier, an injury has forced him to pull out and he has now been replaced by runner-up Gabriel Mazzetti of Peru. The winners of EFN Champions League 3 and 4 were Sean Kearney of Canada and Bow Suweilek of Malaysia respectively. 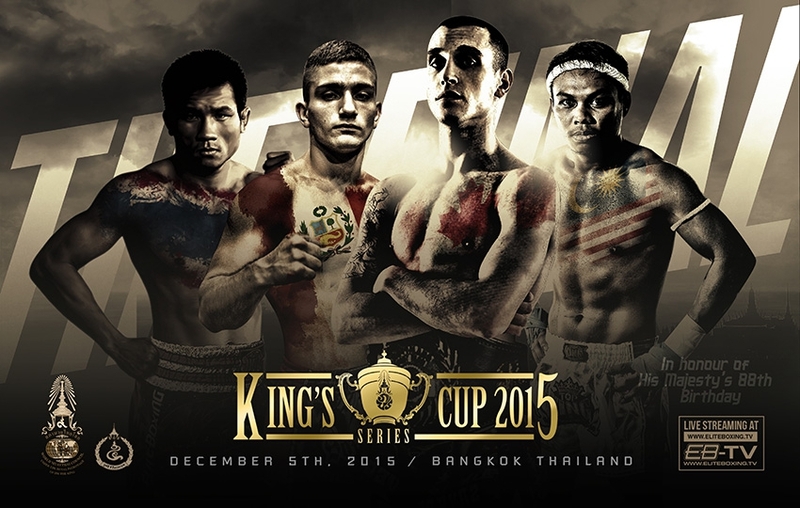 The four fighters will compete in the 4-man King’s Cup Final at Sanam Luang in Bangkok on December 5. The winner will not only take home the King’s Cup trophy and 150,000 THB in prize money but also the title of Muaythai World Champion at 70kg.